Author Russ Anderson, Jr. takes his exciting heroine to a whole new level by revealing secrets she didn’t even know in The History of Flight, the latest digital single in Anderson’s Pro Se Single Shot Signature Series, Fly Girl! Weeks after the gift of a Thunderbird feather gave her the power of flight, Caryn Clay - aka Fly Girl - has finally met someone who knows how it all works - her long-lost uncle, Joe Nez. Uncle Joe isn't here to teach her, though. Joe is here to tell her about when Caryn's grandmother wielded the power of Thunderbird, and to share a warning about what can happen if she doesn't start taking her power, and the responsibility that comes with it, more seriously. The History of Flight is the fifth short story in the Fly Girl series by Russ Anderson, Jr. A Pro Se Single Shots Signature Series from Pro Se Productions. Russ Anderson, Jr. can usually be found in the suburbs of Baltimore, where he lives with his wife, his daughters, an emotionally needy beagle, and a very old, very angry cat. When he's not working for the man, he enjoys bicycling, making up stories, and pie. He is the editor of How The West Was Weird volumes 1,2, and 3. He is also the formatter and designer for Pro Se's Ebooks as well as an author for Pro Se. 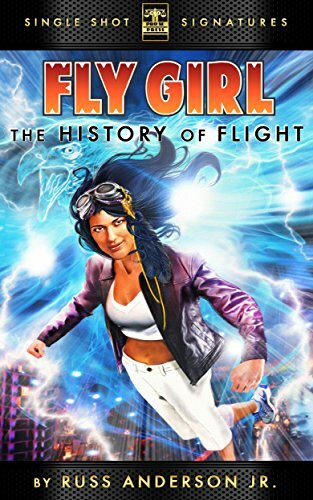 Featuring a fantastic cover and logo design by Jeffrey Hayes and eBook formatting by Anderson, The History of Flight: Fly Girl Book 5 is available for the Kindle at http://www.amazon.com/History-Flight-Fly-Girl-Book-ebook/dp/B00WR7179M/ref=sr_1_1?ie=UTF8&qid=1430276309&sr=8-1&keywords=history+of+flight+fly+girl and for most digital formats via Smashwords at http://www.smashwords.com/books/view/538636. For interviews with the author or more information on Pro Se Single Shots Signatures, contact Morgan McKay, Pro Se’s Director of Corporate Operations, at directorofcorporateoperations@prose-press.com.